A new charter school that opened up this month at 1500 17th St., at a church located at the corner of 17th St. and N. Wright St., in Santa Ana has riled up the Maybury Park Neighborhood. The school is called Legacy College Prep. It is part of the Ednovate program sponsored by USC. The issue that has the neighbors perturbed is that this school opened up suddenly at Calvary Chapel Tustin. There were no public hearings or meetings. Apparently the Santa Ana Planning Agency did not get involved as the church likely has the proper zoning to support a school. The biggest impact on the community has been an increase in traffic. The local streets in the area are now super-congested in the morning and in the early afternoon as parents drop off and pick up their kids. Because the Santa Ana Planning Agency was not involved the city apparently has not looked at the traffic and whether or not the streets in question can handle this new influx of vehicles. The neighbors are also upset as the school has apparently acquired a medical building next door to the church at 1450 17th St. with the intention of either moving the school there or expanding the school there. However that property is separated from the church by N. Wright St. which means that the neighborhood might have to eventually deal with kids running across that street. Picketers from the community have been marching outside the school and now that situation has escalated as the Santa Ana Educators Association, which is the union that represents Santa Ana’s public school teachers, has gotten involved. 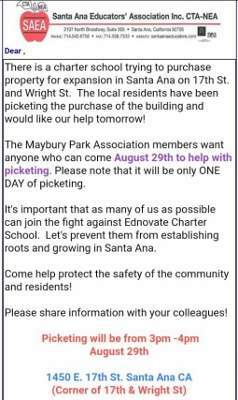 Their union president, Barbara Pearson, has asked her union members to picket the parents and students who attend the Legacy Charter School as you can see in the graphic above. As you might imagine the parents who have enrolled their children in this school are bewildered about the picketing. They say that the protesters have been very nasty towards them. And I have also heard form residents who say that some of the parents have been equally aggressive including one father who threatened to beat up one of the residents. There is no winning in this situation. Both sides have legitimate beefs – and this picketing, while well-intentioned, is just inflaming everyone involved. Unfortunately the Councilman for this area, Vince Sarmiento, is asleep at the wheel, as usual. Residents say he has been completely MIA. They also say that they have seen Mayor Miguel Pulido and Councilman Sal Tinajero visiting the school but neither of those elected officials has met formally with the residents to talk to them about their concerns. At this point the Santa Ana Planning Commission, Code Enforcement and Traffic Control need to get involved to see what can be done to fix the current situation. And the school should host a public meeting so all sides can vent and try to find some common ground. Our community needs good charter schools. But our charter schools also need to be good neighbors. 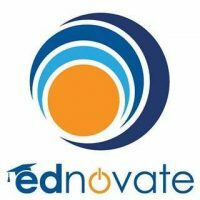 Click here to contact the folks at Ednovate. Click here to email Councilman Sarmiento. Click here to contact the Santa Ana Planning Agency. Is this the same charter school that used to be at Newsong Church on 17th by Flower? If so, is this really a new school or is it just did they just move? That school is still there.it is for lower grades. thanks, and sorry for the poor grammar.